Image of Norman E. Fisher. 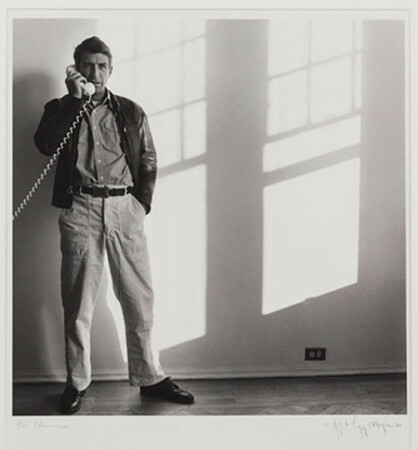 By Robert Mapplethorpe, Untitled, 1972, Museum of Contemporary Art Jacksonville, Gift of Norman E. Fisher. Among the pieces in the collection include signed manuscripts and screen plays, drawings, shots and photos of works in progress, intimate portraits of the collector from some of his artists, etc. Mario Amaya once said that, “Norman Fisher was a collector or people.”  During his time in New York, he established in his penthouse apartment a salon, fittingly called “Norman’s” and displayed the work of the people he collected: Robert Maplethorpe, Mary Heilmann, Gordon Matta Clark, Joseph Kosuth, Lawrence Weiner, and Keith Sonnier just to name a few. He was hospitable and from what can be said in interviews and records about him he was more than willing to give an attentive ear or even aid in times of trouble. Fisher has been considered a collector's collector. He was always "on the hunt." He collected rarities as well as oddities. This also ties back into an earlier statement made, the fact that he also collected people. Among some of these within the collection are poets like Patti Smith, rock gods David Bowie, writers like William S. Burroughs, and modern composers like Philip Glass. This neapolitan group impressed upon him the importance of the progressive, forward thinking attitudes in the arts and the ways in which it could bring understanding to such sub cultures dealing with issues such as gender and identity politics, post modernist attitudes in art through Conceptualism, minimalism, and performance, and the role of women in art society. To say the least, Norman Fisher is not as well known as he should be. He was a subversive collector and curator, entrenched in the subculture of burgeoning art movements that would explode and land certain artists on the international platform in the blue chip art world.